I will skip the detailed physics and mathematical derivations in Professor Semyonov’s paper, as any interested party can check those out in the original article. Hopefully, I have been able to give a reasonably accurate sense of what the author proposes, but you can always go to the source for more information. As far as the actual propulsion of a realistic interstellar craft goes, the author concludes that matter-antimatter annihilation is the only realistic choice. Ordinary fuels, right up to thermonuclear propulsion, simply don’t have the energy density required to accelerate a ship up to relativistic speeds (greater than 10% of the speed of light, or .1c). That being said, they would still be useful for travel within the solar system. This is because these methods release relatively little energy compared to their mass, and since the reaction mass (fuel) must be carried along with the ship (until it is consumed), most of the energy goes into accelerating the fuel itself. This is why standard chemical rockets are so big, relative to their payloads. The problem only becomes worse as really high velocities are attempted, as the energy required to accelerate a mass to a given velocity scales as the square of the velocity in Newtonian physics and this issue is exacerbated in relativistic physics, as the actual mass of the rocket goes up with velocity (i.e. m = m/sqrt(1-v**2/c**2)). So, it is vital that the fuel have as high an energy density as possible. So, how would such a craft work? · First off, you would need to create fuel, likely in the form of anti-hydrogen. Where hydrogen has a proton being orbited by an electron, anti-hydrogen has an anti-proton being orbited by an anti-electron (positron). Currently, anti-protons are made by irradiating metallic targets with high energy protons. Those are then slowed down and combined with positrons (from a separate source), producing anti-hydrogen. The production rates and efficiencies of the current processes would have to be improved by many orders of magnitude, or new processes would have to be invented. Naturally, it would take a lot of energy to create a substantial amount of anti-hydrogen. Ultimately, solar energy would seem to be the most likely source for that. · Then, the anti-hydrogen atoms would be prompted to combine with each other to form anti-hydrogen molecules, in a similar way that hydrogen atoms combine to form hydrogen molecules (H2). Those would then be super-cooled to produce a liquid or solid form. 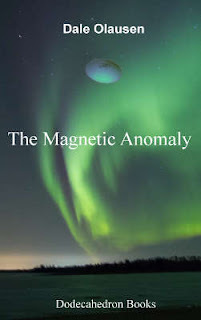 Since the resulting anti-hydrogen molecules are diamagnetic, they could be stored via magnetic containment (a magnetic field gradient), so that they wouldn’t interact with the normal matter, annihilating before ever reaching an engine (and blowing up your spacecraft in the process). Transporting the fuel from storage to engine would also have to make use of some sort of magnetic field processes. o A photon rocket, using gamma-ray level energy photons (created by electron-positron annihilation), reflected against a mirror, creating a propulsive reaction force. o A meson rocket, using charged pi and mu mesons, produced by annihilating protons and anti-protons, which then become the reaction mass for the propulsion of the ship. o A high energy (relativistic) ion rocket, the author’s favoured choice. It seems that this method is more efficient at converting annihilation energy into propulsion energy than the first two, and also has better beam alignment (i.e. the beam can be made nearly parallel, and thus provide more efficient thrust). · The author models a number of cases for a hypothetical craft’s mass and the power level of its reactor, giving expected speeds attained and acceleration durations until half the fuel is consumed. It is necessary to hold back a good amount of fuel, in order to decelerate once the target location has been reached. · There are a number of graphs showing the results, so I will just give an ideal type case as an example. Assuming that the craft can achieve a 50% efficiency rate for turning anti-matter annihilation energy into propulsion, can achieve an ion exhaust velocity of .5c, has an initial mass of about 1000 tons (including fuel), and can put out power at 100 terawatts. o A rocket velocity of about .3c could be reached by the time half the fuel was consumed. o The acceleration time would be a bit under 3 years. o Therefore, a trip to a nearby star (say 4 light years) would take about two decades (3 years accelerating, 12 years cruising at .3c, and 3 years decelerating). · Note that the graphs also show cases for consuming 75% of the fuel, and for other combinations of rocket mass and power. Of course, this all assumes that humanity (or some significant part of it) would be willing to devote the enormous resources needed for the task and could come up with the requisite technologies. Which leads into, the next section. Some important issues would have to be dealt with, even after developing the required technologies for fuel production, propulsion and other spacecraft considerations. Key among these are heat and ionizing radiation. When you generate power, you produce waste heat. That is true of any thermodynamic process. Direct propulsion via annihilation of anti-matter would be no exception. The reactor and turbine walls would accumulate heat, and that heat would have to be dissipated into space. That would have to be done via thermal dissipation, radiators in other words. The efficiency of a relativistic ion engine increases as the temperature drop across the engine increases – i.e. you want at hot engine and a cold heat sink. However, the amount of heat per unit area (and thus the radiator’s mass) that can be radiated away by a radiator goes up strongly with temperature. So, for propulsion efficiency you want a cold heat sink (radiator), but for purposes of dumping waste heat with minimal mass, you want a hot radiator. A trade-off between these goals will be necessary, but this will be a practical limitation on the spacecraft’s ultimate useful power production, and therefore ultimate achievable velocity. Interstellar space contains rarefied gases, as well as dust particles of various sizes. These materials are at concentrations that are extremely low compared to any vacuum we can create on Earth, but they can become a problem to a craft plowing through them at high velocity, especially relativistic velocities. The situation is equivalent to being at rest and being battered by a strong wind; at high speeds the gas molecules and small particles pack tremendous energy. At relativistic velocities this can become equivalent to hard ionizing radiation. A traveller in a ship moving at .5c, with little shielding, would receive a dose of radiation equivalent to being in the middle of a nuclear reactor. So, an astronaut would receive a lethal dose of radiation in minutes, if not seconds. One approach to the problem is to keep velocities well below .3c or thereabouts. The other is to shield the rocket with mass, much as we shield nuclear reactor cores. A strong magnetic field generated in front of the ship could help with charged particles, but dust grains would likely require a shield of solid material. Both would add mass to the ship. Also, turning maneuvers would be dangerous, as the ship could come out of the shadow of its protective shield at such times. Various social factors are also important, both for individuals and society. At the societal level, the most obvious problem is money. Will humanity be willing to spend the sort of money required to explore interstellar space? Just producing anti-matter in the required amounts would be enormously expensive, not to speak of the cost of developing reliable spacecraft of such advanced technology. Also, as the human race becomes richer and more advanced, there simply may be no need or desire for interstellar exploration. With a steady-state sustainable population, there may be little interest in colonization and no demographic pressure from an expanding population. We can already see this in the technologically advanced areas of the world, where the birth rate has largely dropped below replacement. On the other hand, the development of an artificial womb could create entirely new set of demographic pressures, so we can’t be too sure how the demographic issue will play out over the long haul. At any rate, as the author points out, the human race has done some pretty fantastic things over its history, such as populating far-flung islands tens of thousands of years ago, with very primitive sea-faring craft, and no navigational technology or knowledge to speak of. The U.S. put a lot of resources into landing humans on the moon (then shrugged and moved on to other things). Other examples could be listed. So, it is hard to predict the political will of a society, let alone the future human species. Many unexpected, even strictly not rational, things can happen, given enough time. At the individual (or small group) level, the main problem is probably the duration of space flight, even if relativistic speeds can be achieved. Will any crew be able, or willing, to spend a lifetime on a mission? If a habitable planet is discovered, will it be possible to send a large enough group there, to make a self-sustaining colony? How about AI? Can we send intelligent machines in our place? Maybe, but even this is questionable. A journey to any but the nearest stars would take hundreds, maybe thousands of years. We don’t really know how long any machine can be kept in suspense, then rebooted to a satisfactory operating condition, let alone something as complex as an AI capable of doing useful work after centuries of interstellar travel. Perhaps they would be just as prone to entropy and breakdown as we biological machines are. Could this be the answer to the Fermi Paradox – interstellar travel is just too difficult and expensive for any civilization to bother. Maybe once you make your planet cozy enough, you just have no interest in leaving. Or, perhaps it just takes too long, and everyone dies or becomes inoperative (including AI) long before the journey is over. Personally, I hope those things aren’t true, because I still wonder what’s our there, and would like to get a closer look, or at least hope that my descendants do. Now that you have read about a the near-term scientific prospects for interstellar travel, you should consider reading some Science Fiction. 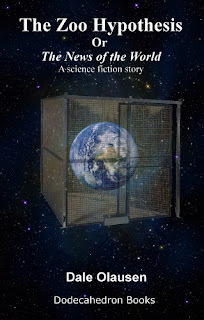 How about a short story, also about interstellar travel. It also features one possible scenario to explain why we haven’t met ET yet (as far as we know, anyway). Only 99 cents on Amazon. In the field known as Astrobiology, there is a research program called SETI, The Search for Extraterrestrial Intelligence. At the heart of SETI, there is a mystery known as The Great Silence, or The Fermi Paradox, named after the famous physicist Enrico Fermi. Essentially, he asked “If they exist, where are they?”. Some quite cogent arguments maintain that if there was extraterrestrial intelligence, they should have visited the Earth by now. 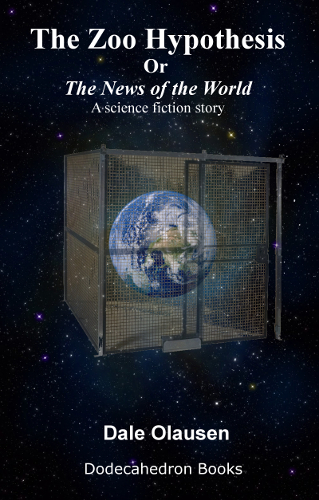 This story, a bit tongue in cheek, gives a fictional account of one explanation for The Great Silence, known as The Zoo Hypothesis. Are we a protected species, in a Cosmic Zoo? If so, how did this come about? Read on, for one possible solution to The Fermi Paradox. The short story is about 6300 words, or about half an hour at typical reading speeds. Alternatively, consider another short invasion story, this one set in the Arctic. Also 99 cents. An attractive woman in a blue suit handed a dossier to an older man in a blue uniform. “Give me a quick recap”, he said.